We fly often, and we always have. Not always long-haul, many of them are also short flights. But they're the same thing, aren't they? Packing, sorting liquids in small bottles, getting a cab ride to the airports, checking in and getting your luggage rejected because you didn't pack too well (it gets better over time), taking off the belts and the watch and the shoes for the scanner, getting laptop, tablet and phones from the bag -once I even had to turn on my laptop at a security check in Singapore's Changi airport! Then the waiting for gate opening, waiting for boarding, the delays, more waiting, the cancellation of the flight.. Then if you're lucky not to be cancelled, there is still the turbulence, the bad coffee in the plane (or no coffee at all), the bumpy landing, and finally the lost luggage (it gets rare now. I haven't lost my luggage since 2007, when flying from Madrid to Los Angeles -my suitcase ended up in Phoenix). Now, with all that mess, add an infant to it. Yup, an infant in the security checks, an infant at the waiting room for the delayed flight, a crying infant on your lap at the take off, and an irritated fellow passenger whom your infant keeps kicking. 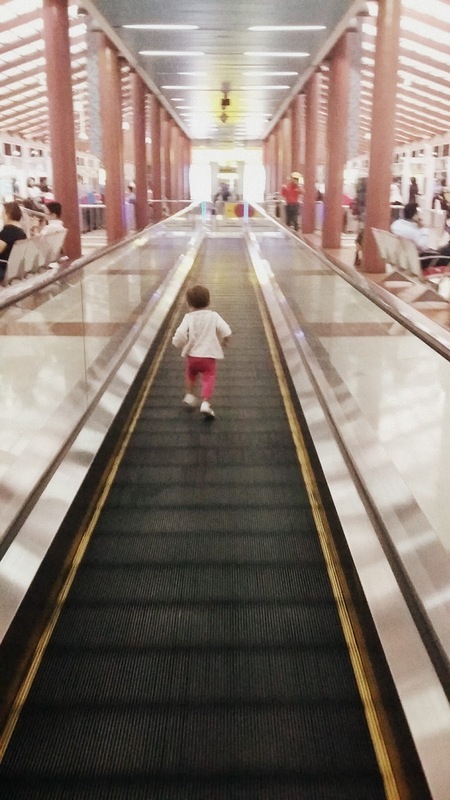 My first flight with a baby was back in July 2014, less than three months after I gave birth to our daughter. 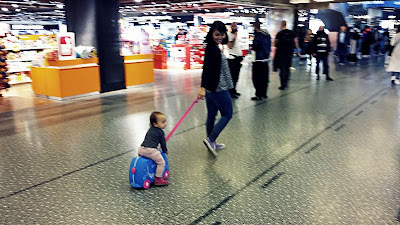 She was two-and-a-half-month old and about to fly from Zagreb to Berlin (which is quite a short flight). I was nervous for weeks. I made a list of everything we possibly needed, not only for the flight, but for the whole trip. We were about to stay in Berlin for a week. I took all possible medications (although she was healthy as a horse), bought disposable diapers for the trip (I cloth-diaper normally), practiced my apologetic phrases to fellow passengers in case she'd be crying the whole flight, packed many many clothes (too many! ), and decided to take the strollers (probably the biggest mistake ever). Flying with stroller is a nightmare. Especially if you're flying alone with your baby (without your significant other). Strollers have to go through scanners in the security checks, so if you own the bulky one, it could get hard to get them passing the machine. They're good when you depart and arrive in big airports where they have the jetway (the tunnel connecting the aircraft with the terminal), because you can leave the stroller right at the entrance to the aircraft and get them back once you get out of the aircraft, but they can be a hassle if you go and land at the airports with no jetways. Especially when you have to pass stairways to go down, get into the bus which takes you to the aircraft parked in a remote area in the airport (happened to me in Istanbul). Then there is the time when the baby screams and refuses to be in the stroller, meaning you use one hand to carry the baby and the other hand pushing the stroller. Forget the suitcases. When my baby was around 6-month old, I traveled to Indonesia, my home country, from Croatia, alone with her, leaving my husband working in Zagreb. To this second I'm grateful I chose the baby carrier. I had a classic Ergo carrier and had the baby on me all the time. I had my two hands completely free, and she can sleep and nurse whenever she wants. If you're not a big fan of nursing in public, baby carrier helps you nurse subtly, without a need of a nursing cover. If you're one of those who really really need stroller, keep in mind that most major airports in the world (especially the international hubs where you'd likely have stopovers) provide strollers to borrow for free. So when you buy your tickets online, most airlines don't offer you option to book a bassinet for your infant. You'll have to contact the airlines' local office to book a bassinet for you. If you don't reserve in advance, by the time you come to the airport the check in desk officer most likely will tell you that all bassinets have been reserved. What's it with the bassinet? The thing is, infant up to two-year-old doesn't get his own seat (unless you pay for one whole ticket for him of course). You pay 10% of the price of your ticket and you're allowed to have him as a lap child. If you don't want to have your toddler on your lap for 14 hours straight, ask for a bassinet. A bassinet is installed in front of your seat hanging on the divider-wall between cabin sections and your baby could sleep in it comfortably. What I like about it, is also the fact that a bassinet could only be installed on the first row of the seats in each cabin section, meaning the biggest leg room! In the morning when she wakes up, I get a flight attendant to take off the bassinet and voila, I get a spacious leg room for my baby to play on the floor. I found this trick out by accident. I was flying to Istanbul alone with my baby and asked the lady on the check in counter for no reason whether the flight is full. She told me "no, it's not. Don't worry, I will block one seat next to yours so you can have two seats with your baby". I used the question ever since. So, when the plane is not fully booked, they can just block one or two seats next to you. They don't care anyway which seats will be empty. If you're flying short flights with low-cost carrier (like Ryan air or Easyjet) on a high holiday season, you probably won't have the privilege. But if you're flying long-haul to some exotic destination on a low season, chance is, the plane is half empty. On our last flights from Istanbul to Jakarta and then from Jakarta to Surabaya, the lady blocked all the mid four seats in a 2-4-2 flight formation for me and my husband, so the three of us (including our lap child) could comfortably rest. The family in front of us was traveling with three children (one lap child and two bigger children) and they blocked a total of eight seats for them! Remember, when you're traveling with an infant, especially alone, everyone would want to help you and to make your journey as pleasant as possible. You might be surprised! Don't over-pack. I know you want to anticipate every little incident, but too much luggage would just make another problem. You don't want to carry more than one bag to the cabin if you're also carrying a child. Check in all suitcases that you could, leaving you with one single bag which double acts as a diaper bag and your purse. Choose a bag with many pockets and sections so you can easily find passports and boarding passes, diapers and wipes, or coins for a massage chair (there are a lot of these in big airports and they work wonder!). When my daughter was younger, I preferred a baby carrier (my Ergo) on my front and a backpack on my back. Now that she walks by herself mostly, we bought her a Trunki ride-on suitcase which she can pull by herself, ride-on and drive, or ride-on while my husband or I pulling it. It's quite neat, we put all of her toys in it and it actually keeps her entertained longer. Most of flights (even the short ones, if they are not low-cost carrier) give away a package of toys or coloring set for infants and children, although I always bring our own toys. We have a "traveling set" toys which we always bring wherever we go. They're basically just a little bit of everything that she has at home, some bricks, one favorite stuffed animal, a wooden music instrument, and a set of coloring pencils and papers. Just so she has a little bit of home every time she travels. Big planes give you a personal entertainment set, meaning a toddler could watch short cartoons. Always check with your pediatrician what kind of medicines (probably also vaccination) you need to pack depending on the country of destination. We always take paracetamol in case of fever, nose vacuum and spray, baby cream for rash, re-hydration mix in case of diarrhea, probiotics, sunscreen and mosquito repellent. You probably know you can't take more than 10 bottles of each 100ml of liquid to the cabin, so you tend to throw away your drinking water before security checks? If you're traveling with an infant, EU and USA laws allow you to bring a (big) bottle (or two!) of drinking water because of the baby needs. Some Asian countries also allow it to my experience, so go ahead and take it. It might not seem too big of a deal in the countries where tap water is drinkable, just carry empty bottle and refill it in the bathroom every boarding room would have. But it becomes a problem when you're flying from a country where the tap water is not drinkable. Sometimes you pass the last security check and you can't buy anymore bottled water (or you don't have local money and the shop doesn't take cards). Last but not least, just enjoy the flight. Enjoy the whole trip! If you're enjoying it, your infant would also enjoy it. If you're nervous, he most likely would also be. They will let you to board early. I mean, it's not like the plane will leave you if you're the last person to board, but sometimes it's just nice! Don't forget to buckle up, and buckle your baby up. You'll get a special infant seat belt which normally is handed to you before take off. You'll have to buckle this belt onto your own seat belt and then wrap it around your child. Your child can be facing front or facing your chest. To day I still have my daughter facing me because she's nursing during taking off and landing, which helps her a lot taking the pressures off her ears. If your baby doesn't nurse, you can also give her bottle or lollipop if he's old enough.